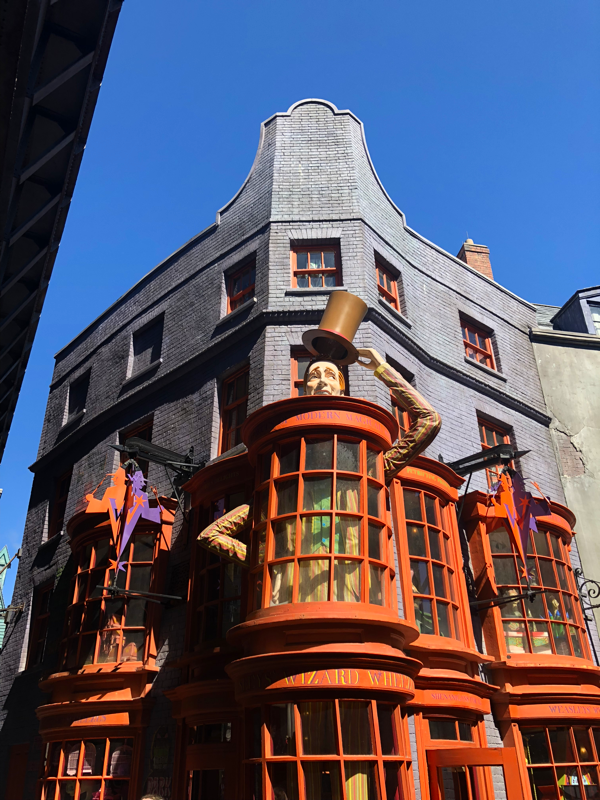 I feel like before we get into it, I need to address a pretty big elephant in the room: if you’re going to Universal only to experience the Harry Potter section, the tickets are expensive. And yet you’ll probably still grit your teeth and pay the price. 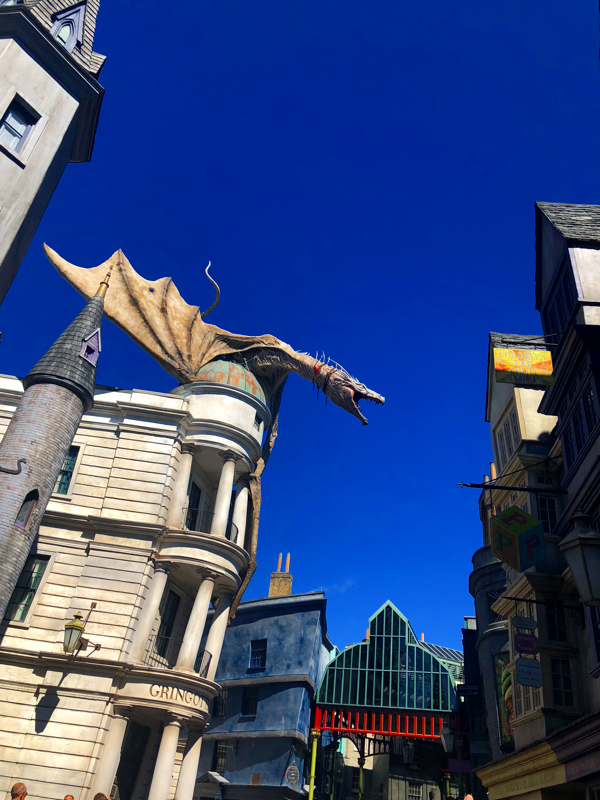 I could live with that – if it hadn’t been for them cleverly splitting the Wizarding World attraction over both the Universal Studios and Islands of Adventure parks. This means you could just buy a 1-park ticket, but you’d be missing out on a hell of a lot, so you end up having to get the 2-park ticket to truly experience all the magic. 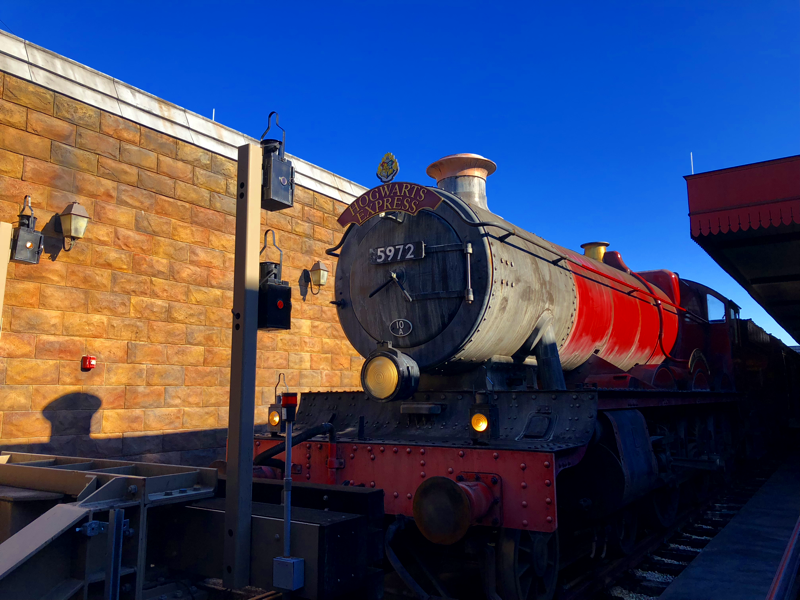 There is a Hogwarts Express replica that takes you between the parks, and there’s some cool special effects projected onto the outside and internal “windows” so you really feel like you’re watching the countryside go past outside, but it still seemed a bit… exploitative, to me. It’s just… yeah, I do love Harry Potter and I had saved up enough money that the price of a ticket didn’t bankrupt me but even I still thought it is a masterclass in opportunism and (to be honest) it’s a bit disgusting in its opportunism, especially when you factor in that a large portion of the Wizarding World attraction is actually just shops flogging you merchandise, albeit amazingly themed ones. Chances are you’ll still pay it though because, like me, your principles might be important but Harry Potter will always make you an absolute sucker. Now, moving onto the actual Wizarding World attraction itself. The level of theming is unlike anything I’ve seen before. 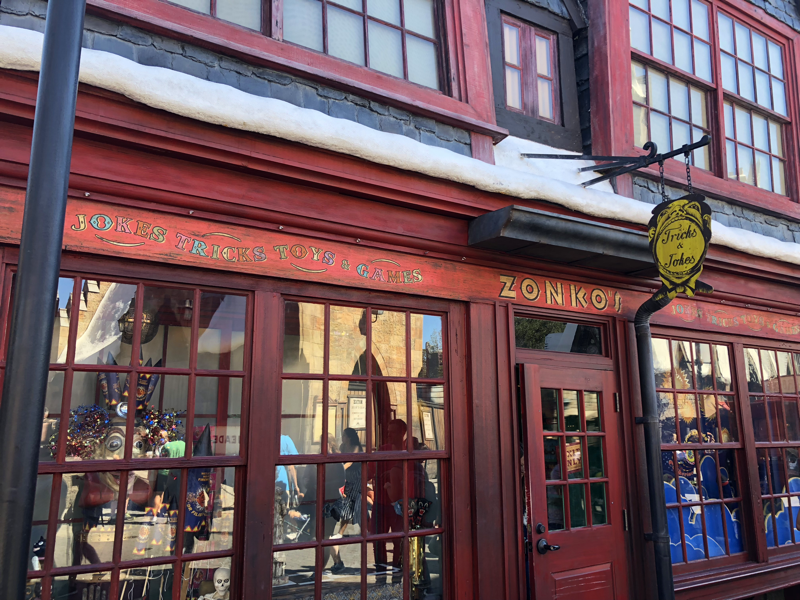 Everything from the food stalls to the toilets to the signage covering bits of the park under refurbishment, everything is so carefully themed to look like part of Diagon Alley and Hogsmeade. It’s that attention to detail which almost makes me forgive the price they charge per ticket because you can see they have put a lot of thought into how the park would function and how to make the experience special for both adults and children alike. The staff members are all clearly so well trained not just in customer service but how to be whatever character they’re playing – whether that’s a student at Hogwarts in front of the Forbidden Journey ride or a conductor onboard the Hogwarts Express or a sales assistant at Weasley’s Wizarding Wheezes. 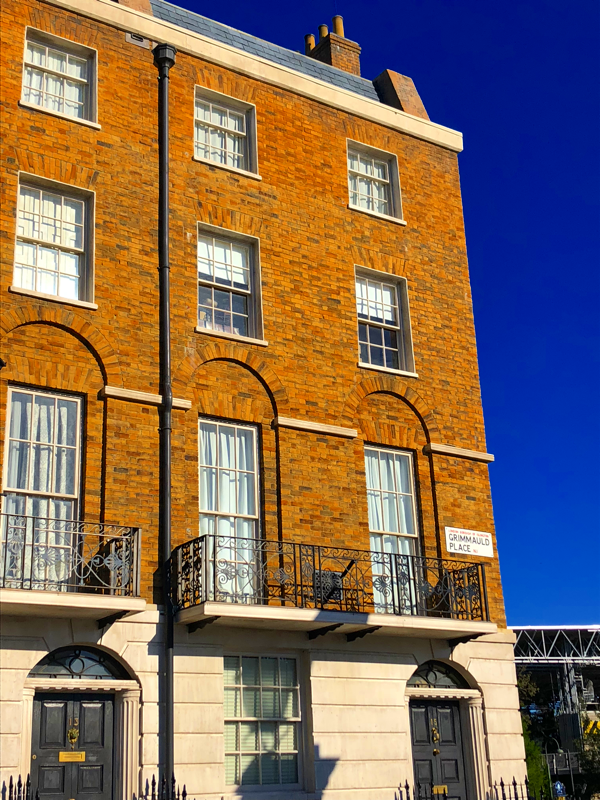 You’ll likely enter the Wizarding World through the Universal Studios park, which means you’re walking down a street with Victorian townhouses and the odd dusty bookshop or two that you might find in London and then… bam… there’s the iconic brickwork peeling apart to reveal Diagon Alley. 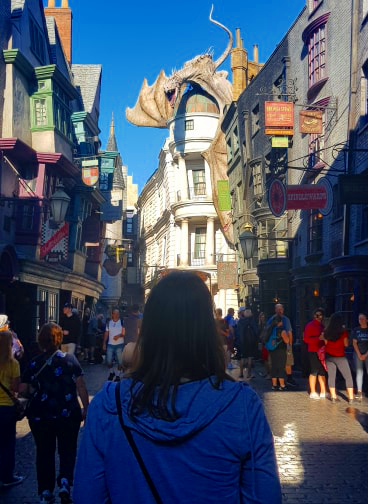 The experience of walking into the street and seeing it lined with Quality Quidditch Supplies, Weasley’s Wizarding Wheezes, Ollivander’s, Flourish and Blotts etc. etc. is… magical, that cannot be denied. I defy anyone to walk into the park as a Harry Potter fan and not feel completely transported into the world of Harry Potter. 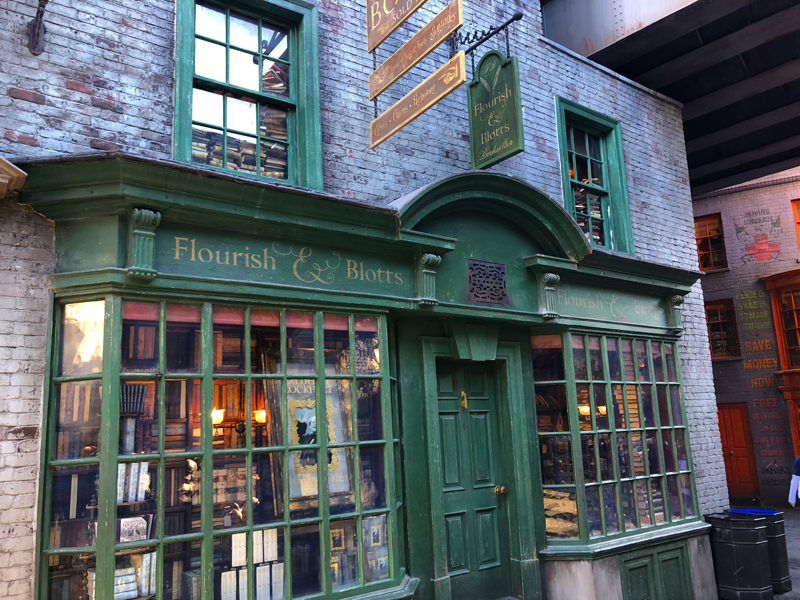 Most of the shops are actually shops, so you can buy a scrumptious ice cream from Florean’s, brave the dark journey down to Knockturn Alley to pop into Borgin and Burkes (watch out for creeping cast members! ), and the wand can choose the wizard in Ollivander’s. 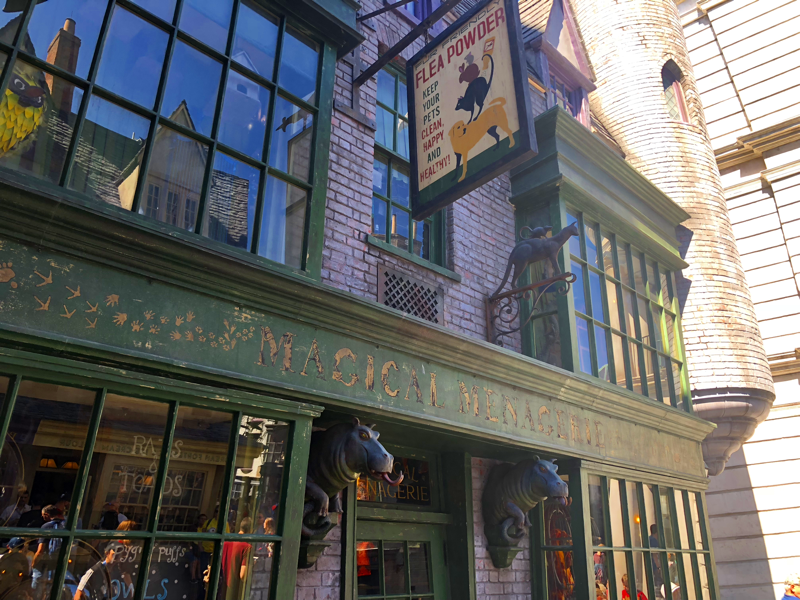 They’ve devised an ingenious element to the wands – if you buy one of the interactive ones from the shop and you stand in front of certain areas in the park and perform “that nice wrist movement we’ve been practicing”, something magical will happen. It was a delight to see young children so delighted by this so I’m glad the Wizarding World incorporated it into its design. Themed on the books and film of Deathly Hallows Part 2, the ride is an indoor roller coaster that uses 3D technology to immerse you in the escape from the bank as what starts out as a tour down to the vaults becomes a mad rush to escape as a security breach is detected, the bank goes into lockdown, and some not very nice wizards pop up to hinder the ride’s journey. You enter through the lobby of the bank itself, as the queuing area snakes around a hall lined by goblins hard at work behind their balance books presided over by an animatronic Bogrod. You then pass through a “Security Check” area – this is an excuse for them to take your photo, if you want a keepsake of the ride (they can’t actually do on-ride pictures because of how it’s set up) but we just bypassed it in favour of continuing on down the corridor lined with clippings from the Daily Prophet. You pass closed doorways through which you can see outlines of various people, including Harry, Ron, Hermione, and Griphook as they plot to break into the vaults to track down an item they need. 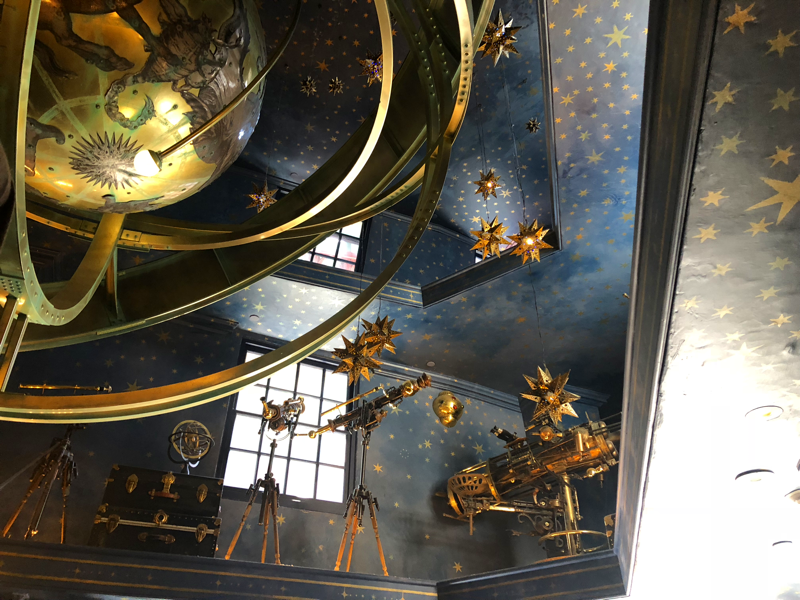 You then enter Bill Weasley’s office as he talks to goblin Blordak about your tour of the bank before Blordak directs you to an “elevator” which takes you down to the vaults, where you grab a pair of ride goggles before being loaded into the ride. The ride is an indoor roller coaster ride and you sit in banks of 4 seats which resemble the mine carts that travel the deep vaults of Gringotts. Bill Weasley pops back up to tell you there’s been a security breach at the bank so your tour will have to be cut short. 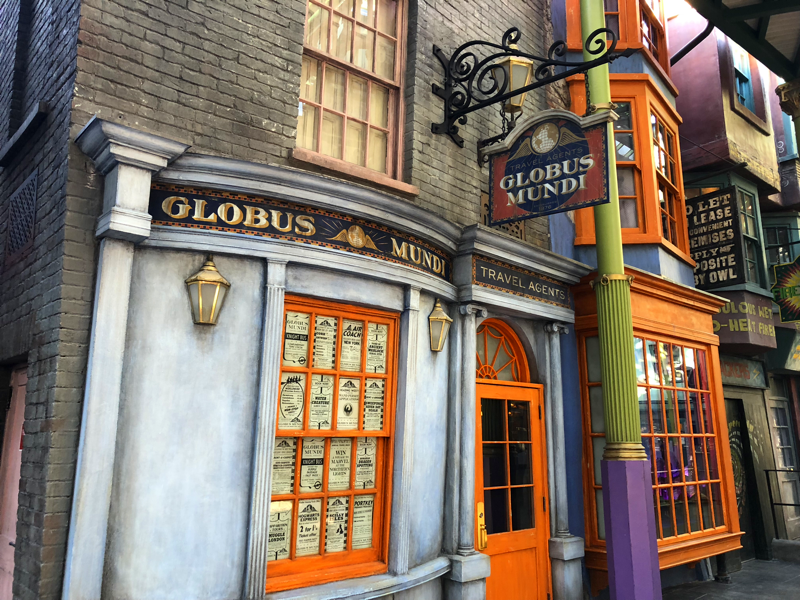 Unfortunately, your ride from then on in isn’t quite so smooth and you face the bank’s security measures, Thief’s Downfall, a rather angry dragon, and the wrath of Bellatrix and Lord Voldemort himself. 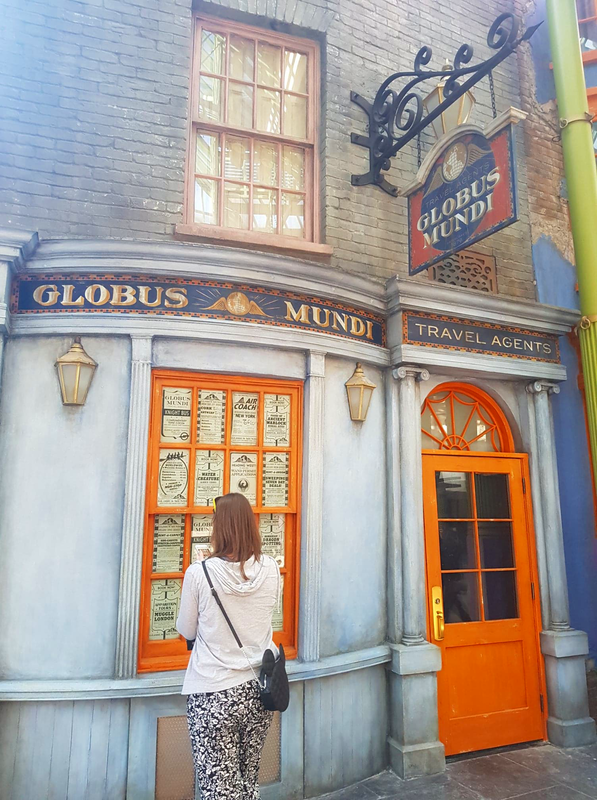 I loved this rollercoaster because it’s well-balanced in terms of incorporating well-loved parts of the story from Harry Potter and the Deathly Hallows whilst also having enough novel and surprising elements to the journey to make it fun and exciting. In order to get to the next “big ride”, you need to board the Hogwarts Express to take you over to Hogsmeade Village which is located in the Islands of Adventure section of Universal. Allegedly the Hogwarts Express itself counts as a “ride” but I kind of dispute that. It’s a people mover, it’s not a ride. And it’s a pretty clever way to move you across the “backlot” bit of the parks. I guess a lot of the thrill in the Hogwarts Express is the magic of the train. Maybe I’m just quite cynical or too old, but it didn’t have the same magic and mystique for me as it clearly does younger children. If I’d visited the theme park when it first opened and I was younger, I’m sure I would have had a different opinion, but as it was I found it great but not mind-blowing. However, let’s focus on the positives. Each train compartment is themed to within an inch of its life, naturally, and the “windows” of the train show a different video depending which way round the journey you’re doing is. 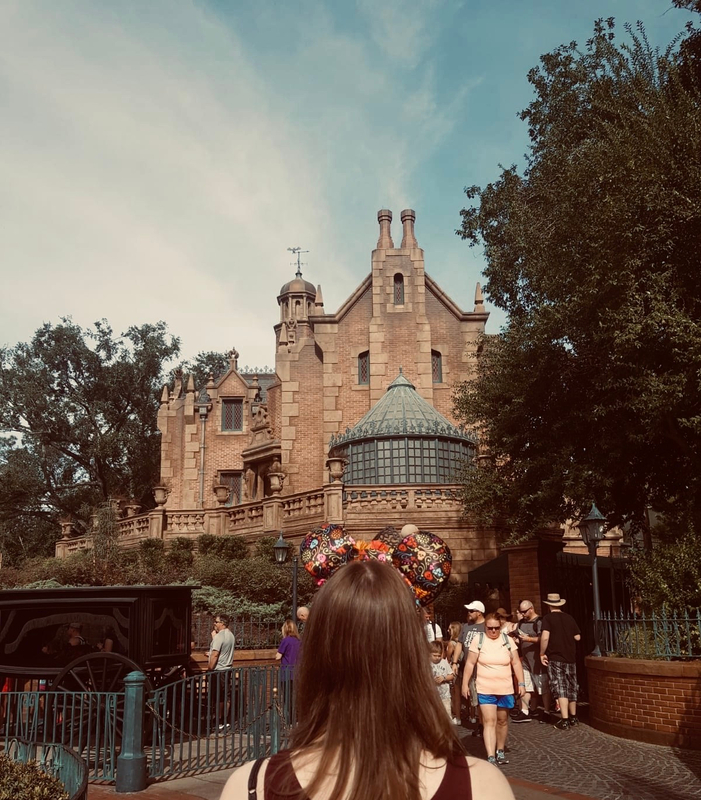 It was a pretty entertaining way to get between the parks and it did make you forget for a few minutes that you weren’t just aboard the Hogwarts Express with the students heading to/from school for the year. 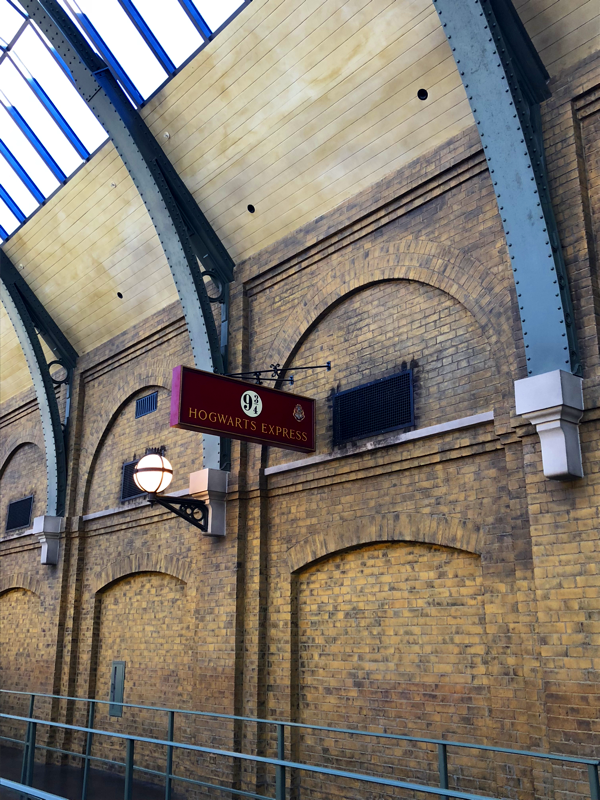 The fact you board through pretty good replicas of King’s Cross and Hogsmeade station adds to that aura – although, I will say, I’ve never seen King’s Cross look so clean before. Then you arrive at Hogsmeade Village which is snowy – a weird thing to get used to when you’re in Florida heat! 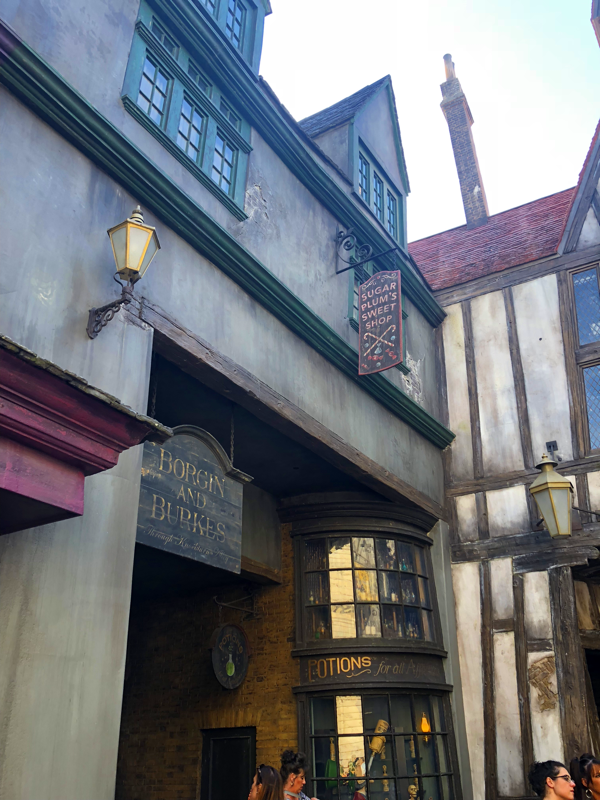 Just like back in Diagon Alley, you walk through Hogsmeade and can stop by some familiar shops and pubs: The Three Broomsticks, Dervish and Banges, Honeydukes, Wiseacre’s etc. etc. But the real main attraction is straight ahead. The Forbidden Journey is housed inside an impressively huge replica of the Hogwarts castle. 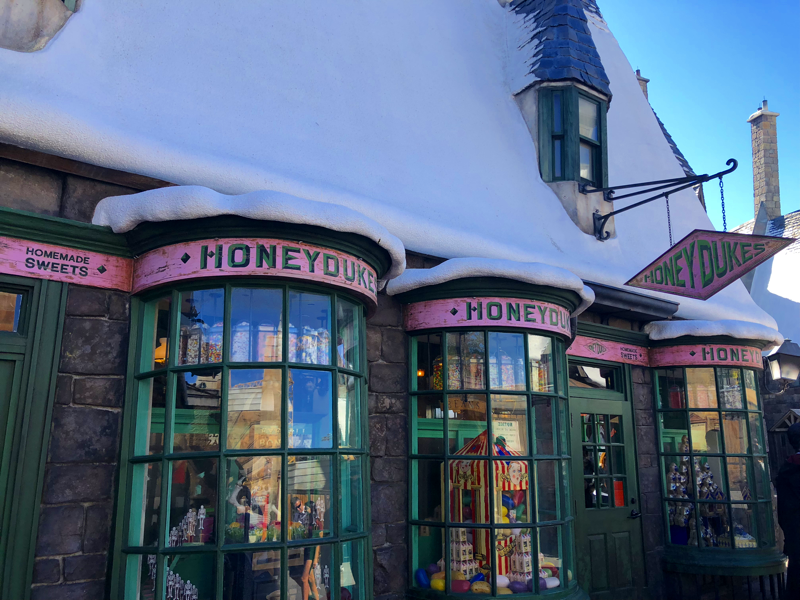 After walking along the avenue of shops making up Hogsmeade village, you’re confronted by this enormous sight and, it can’t be denied, it’s one of the main draws of the entire park. The ride is a dark ride which simulates a broomstick tour of Hogwarts and its grounds. 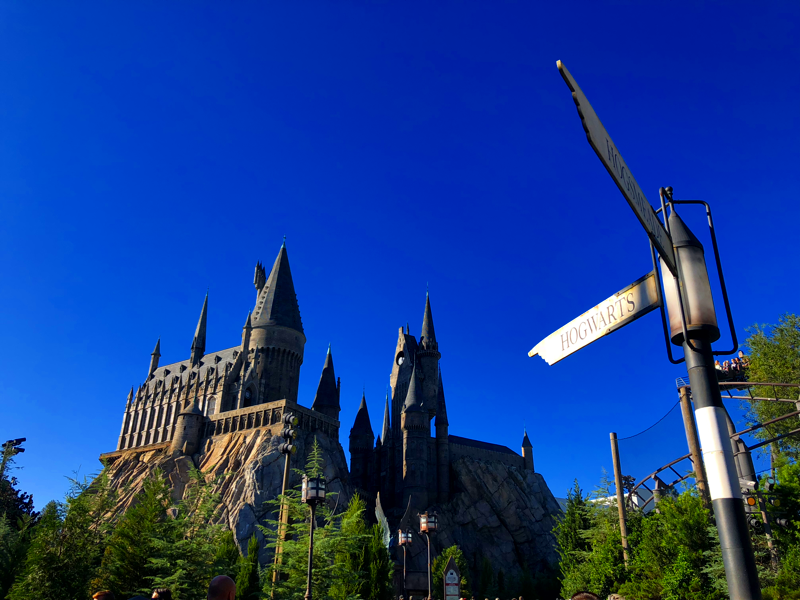 It uses simulations and animatronics in order to really make you feel like you’re flying along with Harry on this journey through the castle and its environs. The technology used on the ride is, frankly, astounding and it’s easy to see why it keeps visitors coming back again and again. It’s unlike anything else I’ve ever experienced… unfortunately, though, it had a pretty huge downside for me personally. I’m going to give you a word of warning: if you experience any kind of motion sickness, don’t close your eyes during the Forbidden Journey ride. I’ve since seen numerous comments online on blogs and Youtube videos advising this if you were scared during the ride. If you feel disorientated and wrong or don’t like spiders or whatever, don’t close your eyes; it only disorientates you further and will make you feel rotten. It’s not an exaggeration to say that I had to sit down outside for a good 45 mins in order to feel well enough to walk around the park normally again. I get car sick sometimes, but that’s about it, I didn’t realise it would affect me so much and it’s only after I went on the ride and felt like I was going to pass out whilst walking off it through the gift shop that I went online to check I wasn’t being a wimp and realised plenty of other people had experienced the same thing. So, yeah, just be advised: this ride is designed to disorientate you and make your body feel like it’s tilting and falling through the air on a broomstick when actually you’re mostly just being adjusted around the bank of super crisp projection screens by an extremely sophisticated gigantic robotic arm. 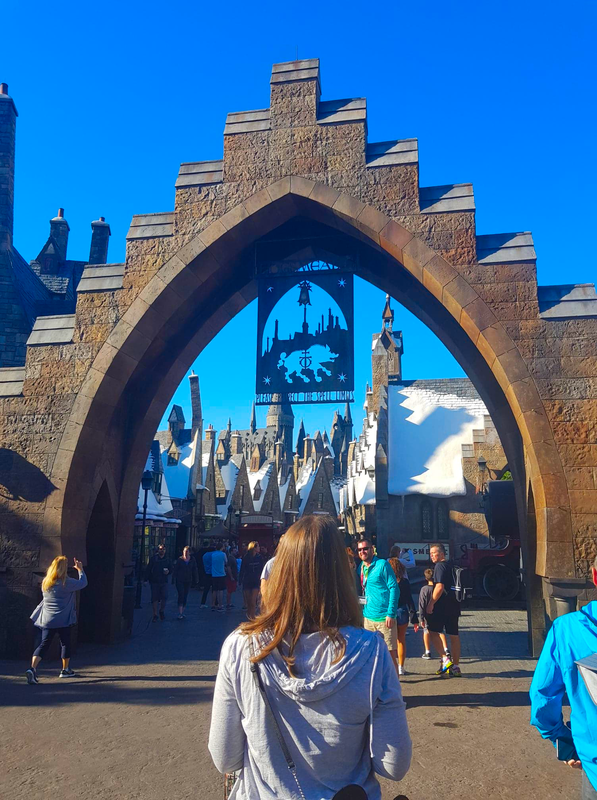 Overall, I would say that the Wizarding World of Harry Potter at Universal is an incredible experience and one which I don’t regret at all. 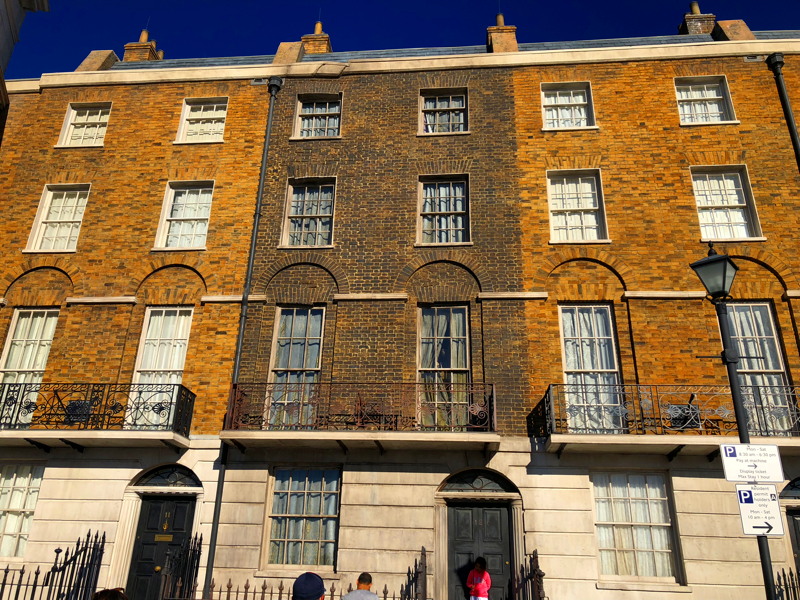 However, I will say that as someone who is English and is lucky enough to be surrounded by a lot of the sights that inspired Harry Potter (as well as more opportunities to buy a lot cheaper merchandise), something of the magic of the Wizarding World is probably a little bit lost on me. I don’t know whether that’s also down to the fact I’m a little bit older now or that I’m just not a rollercoaster person so the rest of Universal Studios and Islands of Adventure was pointless to me. That being said, if you are a Harry Potter fan and you have the means to drop the money for a ticket into the park as well as cover the merchandise you will undoubtedly buy in the heat of the moment, absolutely go for it. It’s certainly an experience. Reading this made me even more excited to experience the Wizarding World this weekend. Your descriptions were great. Did you eat at any of the restaurants?